The two-seat Smart ForTwo is one of the smallest cars on American roads. Measuring just over 106 inches from tip to tail, and a shade under 62 inches tall and wide, the electric version is small enough to occupy the smallest of spaces, from gaps in busy rush-hour traffic to overcrowded parking lots. When the diminutive Smart ForTwo was first introduced in the United States nearly a decade ago, it assumed a somewhat novel cult status—because it was so different from anything else on the street. But with dismal press reviews and anemic sales, the odd looks of the stubby pipsqueak Smart soon started looking goofy. That image persists today. You have to want to make a bold statement to drive a Smart—and frankly, it’s hard to know what that statement is. Although it looks identical to its gasoline sibling, the 2015 Smart ForTwo Electric Drive is marginally larger. You’d have to park it next to a gasoline Smart ForTwo to really notice. That extra length, width and height helps contains a 17.6 kilowatt-hour lithium-ion battery pack and electric motor. The 2015 Smart Electric is offered with the same exterior and interior color options as the gas powered model—except for the Crystal Grey leather interior. But a signature “kinetic green appearance package” is also available as an option with white body panels, white wheels, and green exterior/interior design flourishes. For 2016, Smart totally remade the gas-fueled ForTwo, giving it additional power and interior space, and a more aggressive overall look. The Smart Electric will receive its makeover in late 2016, starting with the 2017 model. There isn’t yet any word on changes to the drivetrain or range of the EV, but it’s reasonable to expect that any updates to the internal combustion 2016 ForTwo will mostly be extend to the 2017 electric model—and that any generational update of an electric car will bring at least a little more driving range on a single charge. 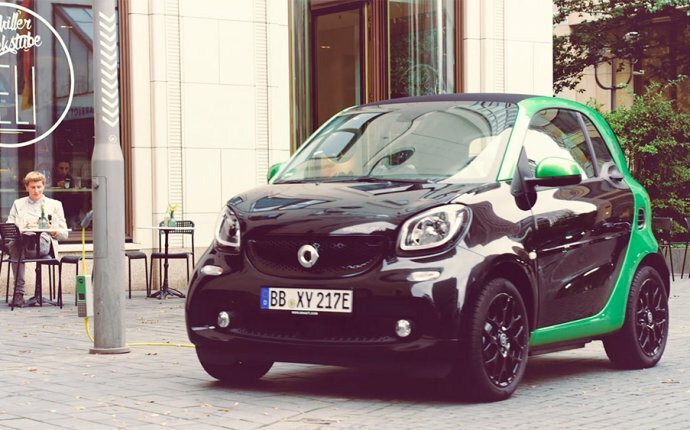 The Smart ForTwo Electric Drive has a 55 kW electric motor that makes 96 pound-feet of torque delivered through a single-speed automatic transmission. Top speed is not great: 78 miles per hour. The Smart ForTwo ED provides 74 horsepower, granting a zero-to-62 mph time of 11.5 seconds. That’s pretty leisurely, yet auto reviewers say that the small EV has enough power for passing other vehicles in the city. However, at low speeds, the lack of power steering and low-ratio rack and pinion create a lot of work for the driver. As with the gas-powered model, the car can feel unsteady—and too easily swayed by the wind—when traveling at highway speeds. Compared with the gasoline Smart ForTwo, the electric Smart ForTwo handles better, thanks to the low center of gravity caused by the floor-mounted battery pack. Still, most auto reviewers believe the ForTwo Electric Drive’s overall ride quality is unrefined, its suspension too easily picks up bumps, and its brakes are mushy. The EPA rates the Smart ForTwo Electric Drive with a range of 68 miles per charge. That breaks down to an estimated range of 76 miles in the city, and 59 on the highway. Given its small size, the electric Smart is very efficient, with an impressive government MPGe rating of 122 in the city and 93 miles on the highway. The combined miles per gallon equivalent is 107. You might find that real-world driving range is even better than estimated by the EPA—as we did when our loaner test car indicated 67 miles of range left, after we had only tipped into the battery pack at about 20 percent. The meek personality of the Smart extends to its anemic charging capability. The standard for EVs these days is an onboard 6.6-kW charger that adds about 20 to 25 miles of range in an hour’s worth of charging. However, the Smart Electric Drive uses a 3.3-kW charger that logically adds 3.3 kilowatt-hours of energy over the course of an hour. That adds up to only about 10 to 12 miles of driving. A full charge from empty to full of the Smart’s 17.6 kWh battery pack takes about five to six hours—twice as long as it would if Daimler, the manufacturer of Smart vehicles, had equipped the car with the 6.6-kW industry standard. On top of that drawback, the Smart Electric Drive does not have a port to access Quick Charging at public charging stations. There is extra height needed to give the Smart ForTwo Electric Drive room for its battery pack under the floor. That height also gives the driver a somewhat commanding view of the road ahead, increasing visibility and managing urban maneuvering with ease. However, tall drivers likely will find the roofline a little too cramped. Our reviewer at 5’10” was less than an inch from the Smart ForTwo Coupe’s roof-mounted roller blind. By the numbers, there is 39.7 inch of headroom and only 12 cubic feet of storage space. Seat adjustments for driver and passenger seats are manual, with little or no lumbar support and no lateral support. Combined with the non-adjustable steering wheel, the Smart ForTwo Electric Drive isn’t a car best suited to long hours of driving. In fact, despite having the warmest seat heaters of any car we’ve driven, spending more than half an hour behind the wheel resulted in a stiff back. Also, as with other Smart ForTwo models, radio and navigation controls are not within easy reach for the driver. While it shouldn’t be an issue for larger drivers, smaller drivers may find themselves stretching to operate the large center-mounted infotainment system.